Web Mapping Server Solutions - Urban Mapper Ltd. Web mapping server solutions enables you to share maps (also shapefiles, raster maps, spatial content, statistical data, etc.) for specific target audience. This audience might be potential or existing customers, employees, general public or other group of interest. It substantially improves data and communication flow between editors, providers of spatial data and the actual map users. Respectively, it empowers critical operations, such as urban planning, agriculture, environmental management, recycling and waste management, logistics, network investments, insurance/ risk assessment and many more. In this manner, web mapping tend to be new alternative of static maps (on paper) in this constantly evolving world. At Urban Mapper we strive to provide data with top quality, integrity, statistical context in order to increase the performance of our business partners. Being able to synchronize project management, data users and data providers on one place and deliver up-to-date information to all involved in a geo-project is a great process automation opportunity. … that allows online data management of users, data, work-spaces, privileges and this means - flexibility to operate with the system from everywhere with internet access and a web browser and nothing more. … differentiate users in several groups of interest in a geo-project and establish access control, usage and editing properties of the data that you share. … allows data storage and editing with popular software, such as QGIS (Quantum GIS) and on the other hand provide the opportunity for advanced spatial functions and analytical advantages. … compliance with most common spatial formats that enable working environment per your needs. … provides opportunity to relate up-to-date statistical data for Bulgaria with client input - the provided spatial information from the region. Are you ready to align your spatial data to this ever-evolving world with web mapping server? It enables you to share plans, programs, projections for particular area of interest with the population, government, business and investors. It provides opportunity to collect environmental data from custom designed surveys, produce environmental assessments and track waste collection trucks. 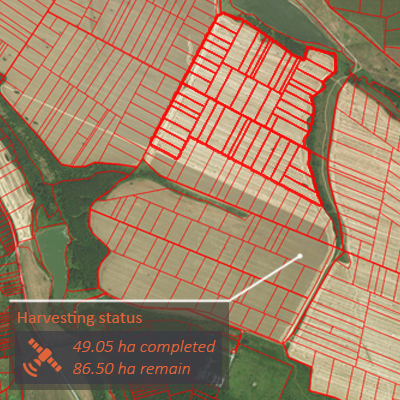 Being able to track farming of agricultural land enables accurate coverage of provided land and better process planning. In other words, possible cost reductions. Location services for vehicles and cargo. It provides options for network mapping and infrastructure development. Solutions for branch network development, risk assessment, evaluation of natural disasters and fast assessment of property damages in particular region with crowed sourcing. It enables optimization of spatial data sharing, improves communication flow and secures data integrity of a geo-project. ... we will provide you access to fully-functional web server and dedicated database in postgreSQL server – integrated. ... you will be able to define who will see your data, edit it, or create new features, files. On the other hand, the same approach might be applied directly in the database. ... of course you can bring your own data, collect your own points/places of interest and map, edit, analyze and visualize it directly from QGIS. Follow the links below and find out more relate products at Urban Mapper.